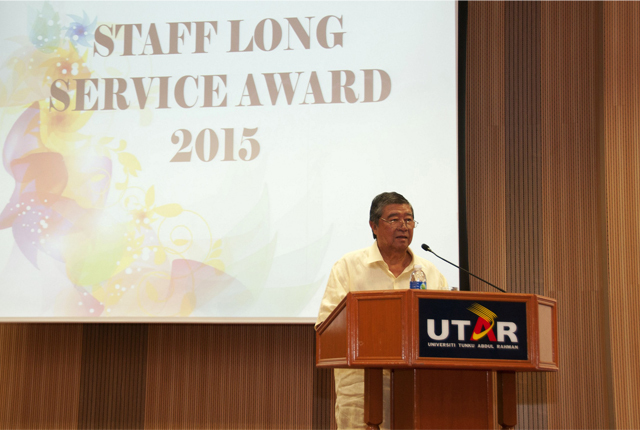 UTAR held its Long Service Award in conjunction with an appreciation lunch for UTAR staff and contractors at the Multi-purpose Hall in Sungai Long Campus on 1 August 2015. The purpose of the Long Service Award was to honour the contributions and dedication of staff members who have served for ten years or more in UTAR. The appreciation lunch meanwhile was to show our gratitude toward contractors for their diligent work in completing the new KB block, and staff whose patience and cooperation led to the successful relocation to Sungai Long from the Setapak and Petaling Jaya Campuses. 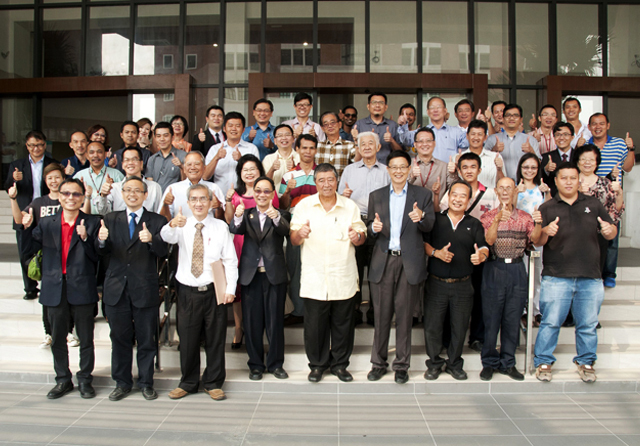 UTAR Chairman Tun Ling Liong Sik was on hand to deliver his personal thanks to all the staff during his opening speech. “It is very heartening for me to join all of you at today’s Long Service Award Presentation Ceremony to show appreciation to the loyal staff who have stayed with us over the years. I wish to congratulate all recipients of the Long Service Award and to thank you for the support and service to the University,” he declared. Reminiscing the past, Tun said, “I can recall the early period in the establishment of UTAR in 2002. It was tiring and was an uphill task that demanded great effort in planning and organising to establish the University. The dedicated staff were very focused and together we paved the way to build the foundations for UTAR. Therefore, it is important to acknowledge the staff’s service for they are the backbone of the administrative machinery that ensures the smooth running of the University." Before Tun Ling ended his speech, he quoted Henry Ford who said, "Coming together is a beginning. Keeping together is progress. Working together is success.” Tun Ling said that after more than 10 years of working with UTAR, we have all now come together to celebrate with the award recipients the beginning of another decade of progress and to foster the spirit of working together to a higher level of success. 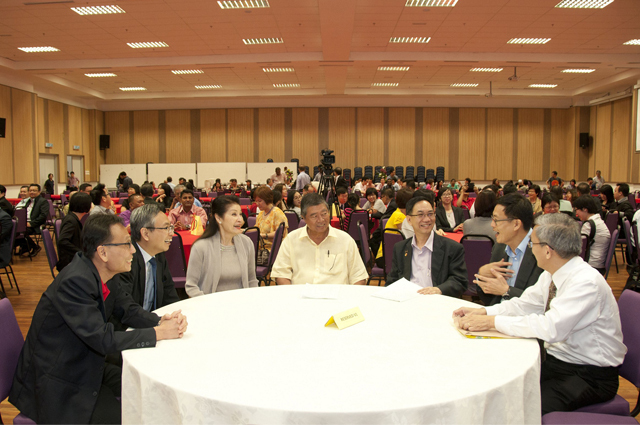 All the recipients were then invited onto the stage one by one to receive their award presented by Tun Ling himself. Subsequently in the second half of the programme, UTAR President Chuah Hean Teik took to the stage to deliver his speech of thanks to gathered guests. He congratulated the award recipients and thanked them for their support and contribution towards the university. He said, "This is a token of appreciation for helping to make the impossible dream come true for the university. I am indebted to the consultants, contractors, UTAR staff, developer, movers, and cleaners who worked tirelessly, even unto midnight on many occasions, to deliver the campus building ready in time to commence in June 2015. It was an incredible feat and I have all of you to thank for." Prof Chuah elaborated that he was particularly thankful to the movers who facilitated the move in three weeks instead of the original one and a half months planned. He pointed out one particularly striking instance where 70 workers were gathered to help carry 9,000 boxes of library books by forming a human chain up from ground floor to level four. They undertook this process because the lifts were then utilised for the moving of other equipment and furniture. 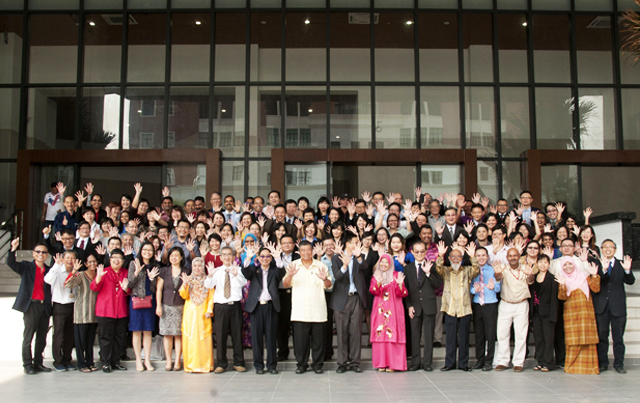 Prof Chuah was very moved by the spirit of cooperation among all UTAR staff. Chief among them was David Chan, the head of the Department of Estates and Facilities, who helped to monitor and coordinate the overall construction and development of the campus building. The event ended with a lavish appreciation lunch meant to signify the end of years of planning, fund raising, construction of the Campus, the move, and the organisation of the facilities and equipment. It was a long journey from the start but it brought many people together for the sake of UTAR and for the students.